Congratulations Dr. Tracy Middleton, ACOFP's Educator of the Year! 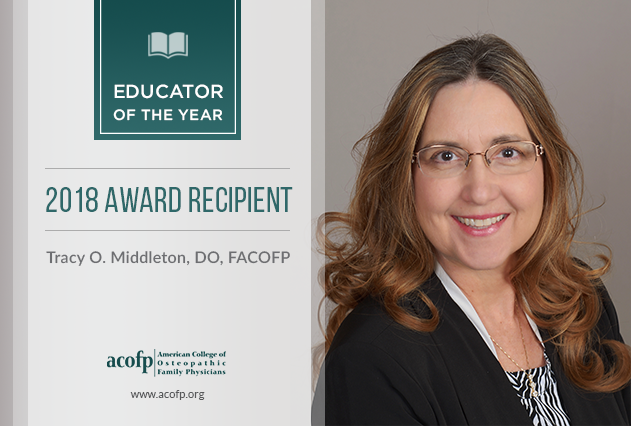 Tracy O. Middleton, DO, FACOFP, SSP Theta Chapter member and Rho Chapter faculty advisor will be recognized this March by The American College of Osteopathic Family Physicians for her continued excellence as an osteopathic educator. We congratulate her on this very prestigious recognition. She will be honored at ACOFP '18.